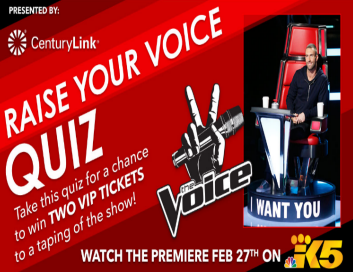 King 5 & CenturyLink Raise Your Voice Quiz Sweepstakes – Win a trip to see a taping of The Voice! Win a trip to see a taping of The Voice in Los Angeles! ENTER SWEEPSTAKES HERE – King 5 Facebook page. ENTRY LIMIT – You will receive (and be limited to) one (1) entry per person simply by taking the quiz, and ten (10) bonus entries for each Facebook friend who enters the Sweepstakes. ELIGIBILITY – “Raise Your Voice Quiz Sweepstakes – Presented by CenturyLink” (the “Sweepstakes”) is open to legal U.S. residents of the State of Washington who are 18 years or older at the time of entry. SWEEPSTAKES ENTRY PERIOD – The Sweepstakes will begin at 12:00 PM (noon) PT on January 23, 2017 and end at 11 PM PT on February 28, 2017. PRIZES – One (1) Grand Prize Winner will receive a trip and two Guest Passes to see a taping of The Voice at The Voice Stage in Universal Studios in Los Angeles, CA. Winner must be able to travel on these dates: 5/15/17 through 5/17/17. Prize includes ground transportation to and from a Southern California airport and the hotel, two nights double occupancy hotel accommodations, and two tickets to the Voice. Total Grand Prize ARV: $1,255. (Total ARV: $1,255).